There is a mass awakening on earth as people are waking and walking into their paths as healers, teachers, wayshowers, lightbringers, peace warriors. There is a mass awakening on earth as people are waking, learning, going to healers, teachers, guides. Each of us has an inner healer, an inner guru, an inner light. 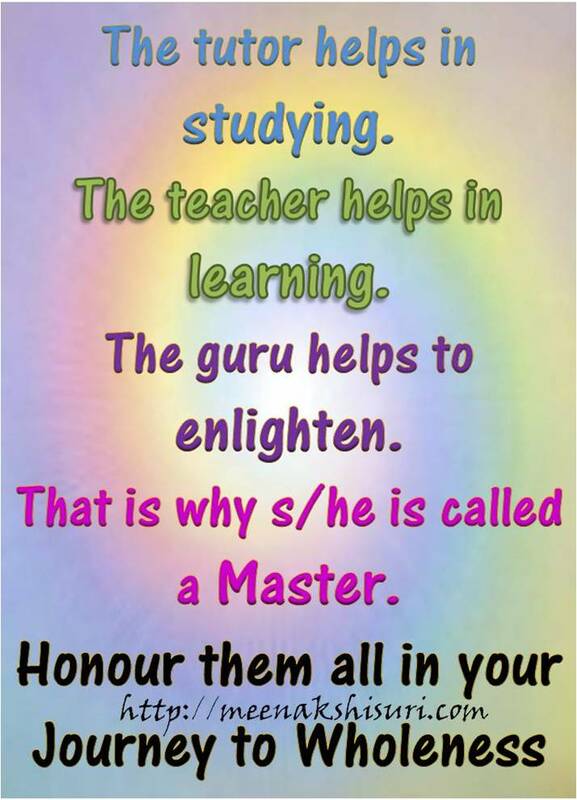 Each of us has many teachers, tutors, guides. Each of us at different times takes these different roles: as tutor we help the ones who’re struggling; as teacher we help the ones who’re seeking; as guru we enlighten. Honor all. Together we are in a beautiful journey, awakening to our wholeness. Posted on December 15, 2014 by Meenakshi ~ Journey In WholenessPosted in Blog, Training the TrainerTagged enlighten, guide, journey, light, master, struggle, teacher, tutor, wholeness.